December UK release date for Nintendo 3DS? The Nintendo 3DS is not likely to arrive in the UK until December, with the company's hopes of an October release ahead of Christmas likely to be confounded. According to CVG, who have spoken to a senior games retail source, plans for an October launch are now being abandoned, with a limited amount of stock now set to appear in December. That leaves precious little time for those hoping to upgrade to the latest handheld for Christmas will face a battle for units and a race against time. 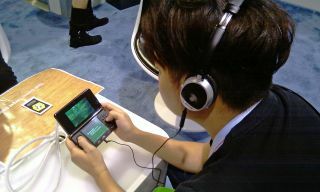 "Early indications to us are that the launch is going to emulate Wii in December," the source told CVG. "We've been informed that Nintendo wanted a long run-up to Christmas, but now it's going to be a close-run thing. "We're not expecting a lot of stock before next year." As you may imagine, Nintendo has insisted that all talk of a release date is still speculative.